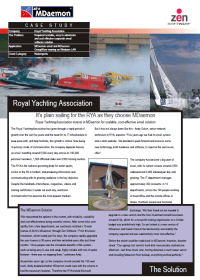 The Royal Yachting Association is the National Association for all forms of sailing and windsurfing, motor cruising, sportsboats, personal watercraft and powerboat racing. It is recognised by all Government offices as being the negotiating body for the water activities it represents. The RYA has gone through a rapid period of growth over the last five years and the need for its IT infrastructure to keep pace with, and help facilitate, this growth is critical. Now being its primary mode of communication, the company depends heavily on email handling around 5,500 every day across its 100,000 personal members, 1,500 affiliated clubs and 3,500 training centres.